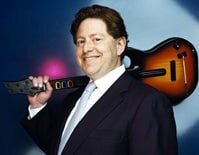 President and CEO of Activision Blizzard, Bobby Kotick, did however continue to laden praise upon both the publisher’s Call of Duty and World of Warcraft franchises, stating “Activision Blizzard’s key franchises have larger audience bases than ever before and we continue to see significantly enhanced user activity and engagement for our expanding online communities. Our revenues from digital channels, which now account for over 30% of our overall revenues, were driven by increased sales of Activision Publishing’s Call of Duty map packs and value-added services for Blizzard Entertainment’s World of Warcraft. I like CoD as much as the next guy, but do other gameplay experiences REALLY need to be cancelled to make way for more of it? REALLY? aww, I was really hoping that the rumours of Red Hot Chili Peppers guitar hero were true, If only they’d made that before it got axed 🙁 oh well, it was about time guitar hero died, Rock band continued to develop whereas they just stuck with what they had. I agree though, although CoD is a great game, there should be no need to go and cancel other games for it, people like Bobby Kotick are ruining the games industry and what it is today.